Andrea Guolo looks into Spain's position and influence in Europe's tannery stakes. This was the explanation offered by Bruno Pavlovsky, president of the Chanel fashion division, the day after the acquisition of Spanish tannery Colomer, or more accurately, the acquisition of what remained of Colomer after the restructuring process that led to the loss of jobs and the closure of facilities. This followed a struggle to compete with low-cost rivals from other countries, and the divestment of part of the business with the transfer of know-how to Chinese tanner Henan Prosper. In 1997, Colomer invoiced the equivalent of €113 million, while in 2017 consolidated sales amounted to only €38.5 million. The case of the tannery, which has now become part of Chanel (joining other tanning divisions such as the French Bodin- Joyeaux and Megisserie Richard), is symptomatic of what is happening more generally in the Spanish and European sheep and goatskin sector – to the advantage of Chinese, Indian and partially Turkish competition. This has resulted in a progressive reduction of the number of independent European players, which is endemic of bigger M&A realities (take the case of Italy’s Albatros, once a world leader in the shearling sector, but which has subsequently failed) and a gradual entry of the luxury holdings into company property, where the structural crisis of the tanneries specialising in small leather puts certain strategic supplies at risk. In Europe, however, niche production remains, while the mass market is moving elsewhere in the world. The consequences weigh above all on countries that possess historical know-how in the field of small leather, either by tradition or by internal availability of raw materials. And Spain, a land of merinos and entrefinos, is certainly a leader in this sector; a leader, however, weakened by the weight of this change. The same specialisations enjoy similar success in Italy and Germany, particularly those related to bovine hides destined for the automotive industry. “In Europe, we are the second-largest finish leather producers, behind Italy, and our problems are not particularly different from those of the Italians or French,” says Carlos Riba, CEO of Riba Guixa and vice-president of Acexpiel, the association of Spanish tanners. “Of prime interest are the image of the sector, compliance with increasingly restrictive regulations in the industrial sector, and the qualitative situation of raw materials, and all those issues are open at national and European level. Riba’s impressions are confirmed by the data processed by Acexpiel for 2017. Last year, in Spain, there were 99 tanning companies, with a total workforce of 2,250 employees. Over half of the companies operated in the territory of Catalonia, 25% in Valencia, and the rest in Murcia and other regions. With a total turnover of €691 million, the bovine business generated revenues of €457.5 million, while sheepskin (double face, nappa and suede) was slightly more than €120 million. It should be noted that no tannery in Spain exceeds 200 employees and that only six tanneries have over 100 employees, including Riba Guixa, which has 125. But there is one aspect that distiguishes Spain – its low imports. “Italy imports 80% of hides used while Spain is more autonomous, and my tannery in particular works with 90% from domestic raw materials,” confirms Riba. 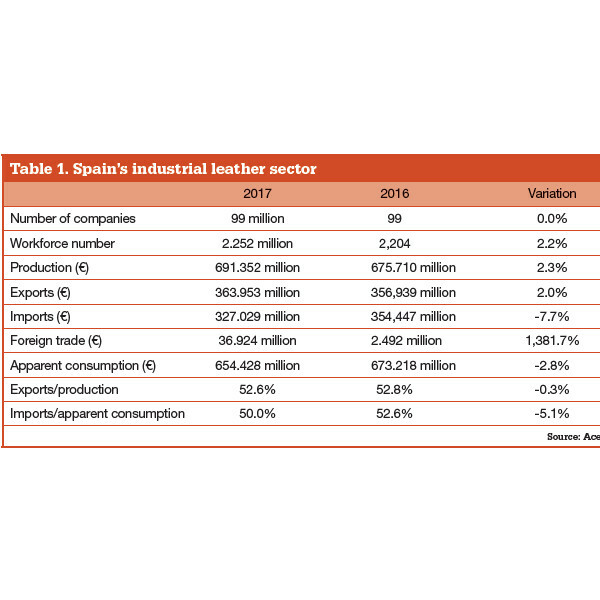 The data for 2018 confirms the positive trend of the export of Spanish leather. While, in 2017, the value of production increased by 2.3% – with peaks of +10% for the double face, partly due to the increased demand, and partly due to the increase in prices of the best grades – the first six months of this year saw a particularly positive trend in exports, with foreign turnover increasing from €188 million to more than €200 million (an increase of 7%), driven once again by double face, which increased from 22 million to 30 million (+37%), and with the strengthening of bovine leather as a dominant speciality (€124 million turnover and an increase of 6%). So what is now the particular strength of the Spanish tanneries? “Over the past decade, as a result of the global crisis, the industry had to focus on finding a sustainable competitive advantage,” Garcia says. “Like most European industries, the tanning industry achieved it through the following process: more quality raw materials position it as an international reference product, breaking away from the competition of emerging countries; strengthening collaborations with the big brands; providing greater investment in research and development; and creating clusters to intercept possible synergies,” she adds. This all took place in Spain during a generational turnover phase in companies that grew up during the economic boom years immediately following their entry into the EU. But what does the future hold for Spain’s 99 tanneries? Will it be an independent future, or will other operations such as the one recently concluded by Chanel with Colomer increase the level of vertical integration in the world of luxury? “As a tanning association, we cannot exclude a future characterised by a greater integration, in the form of vertical, horizontal, cross-sector alliances, or in the form of joint ventures,” says Garcia. “Like any other industry, not even the tannery can be considered extraneous to strategic partnerships because those partnerships reduce the risk level of all the involved parties. Therefore, they are of interest to the Spanish tanneries that desire to consolidate their international sustainability.